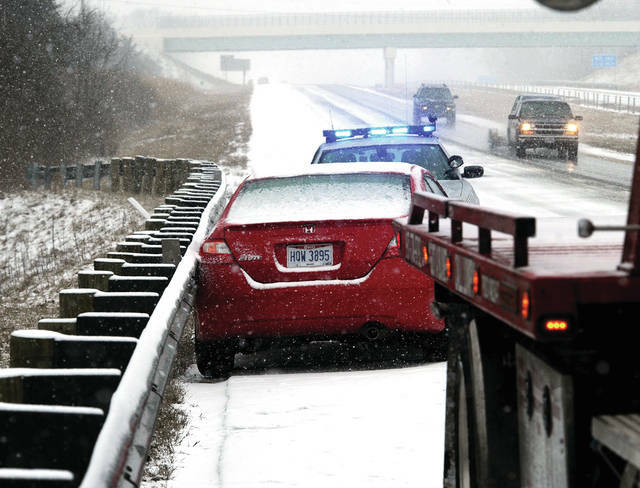 As snow began to fall across Miami County on Sunday, a number of crashes occurred on I-75 causing backups and the eventual closure of the highway as emergency crews worked to clear many crashes and slide-offs. An SUV sits at the bottom of an embankment following a crash on southbound I-75 at the 78 mile marker on Sunday afternoon. Two victims were transported to Upper Valley Medical Center from this crash. 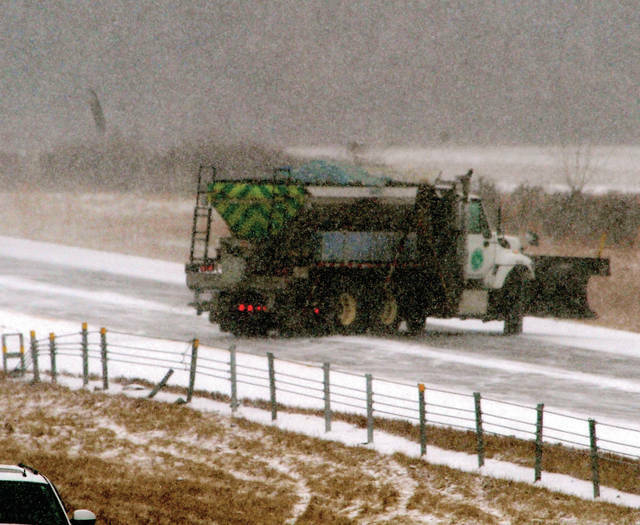 An ODOT snowplow makes a turn on I-75 as crews rushed to get salt onto the highway on Sunday as incoming snow led to a number of crashes. Firefighters from Fletcher Fire Department assist a motorist who crashed on I-75 near the 80 mile marker on Sunday. 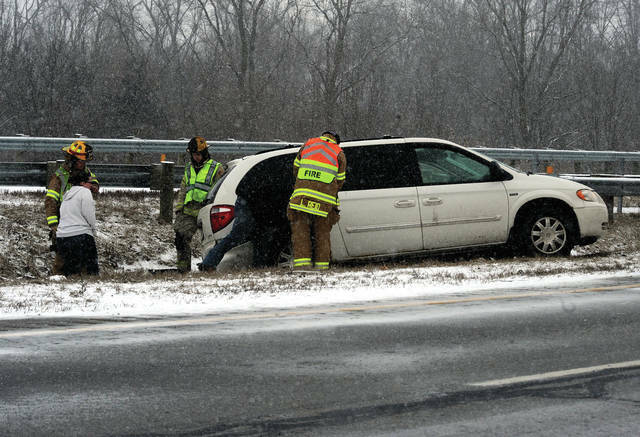 A tow truck and a trooper from the Ohio State Highway Patrol assist a motorist who spun out and hit a guardrail on southbound I-75 near the 79 mile marker on Sunday. A Troy police officer sits at the top of the northbound entrance ramp to I-75 on Sunday after the highway was closed due to a large number of weather-related crashes. 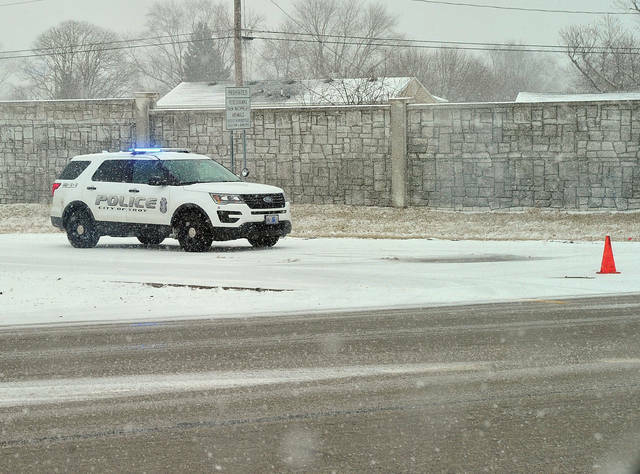 MIAMI COUNTY — As snow began to fall across the area on Sunday afternoon, area law enforcement, fire and EMS crews faced on onslaught of crashes and slide-offs on Interstate 75. Crashes, several involving injuries and rollovers, began around 1:30 p.m. at the 78 mile marker where an SUV that was southbound crashed through a guardrail and rolled down a 30 foot embankment. Two victims were transported from the scene by ambulance. Several other crashes between the 78 and 82 mile markers had Miami County 911 dispatchers playing a chess-like “game” as they sent medic units from crash to crash as fast as law enforcement and fire units could check on injuries. 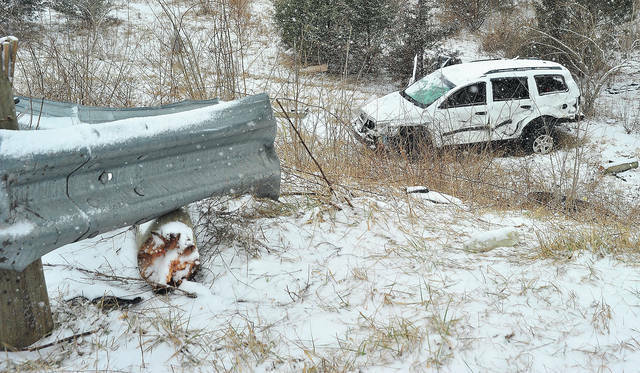 A crash near the 83 mile marker involving a US Mail truck was one of several reported north of the Piqua exits. 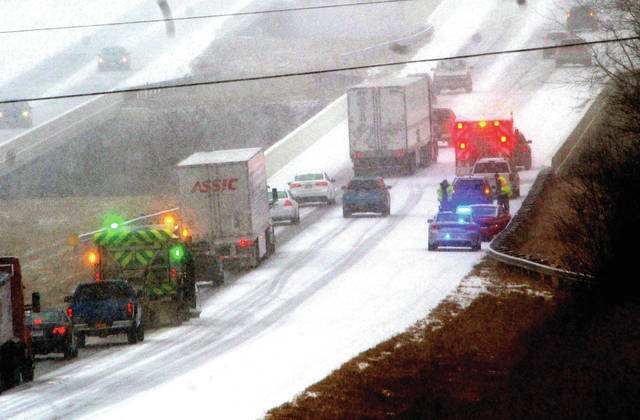 Troopers from the Ohio State Highway Patrol, Miami County Sheriff’s Deputies, Piqua Police and Troy Police made the decision around 2 p.m. to close I-75 to traffic until the crashes could be cleared. 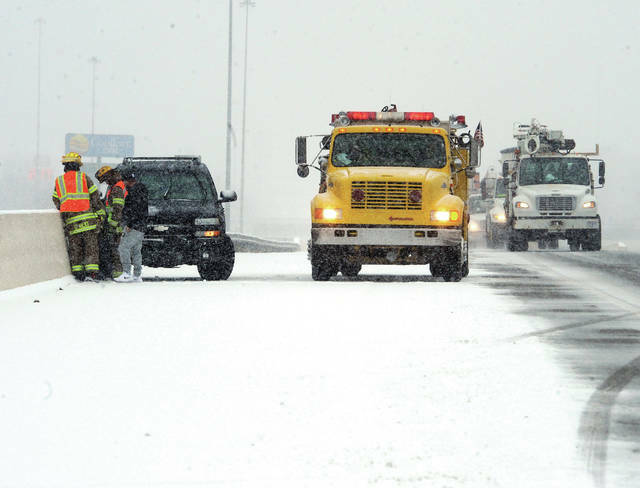 The decision was made not only due to road conditions but also for the safety of emergency personnel on the highway. Medic units from Piqua, Troy, and Covington provided EMS services at the crash scenes. There is no information available at this time as to the total number of crashes, injuries, or extent of injuries.